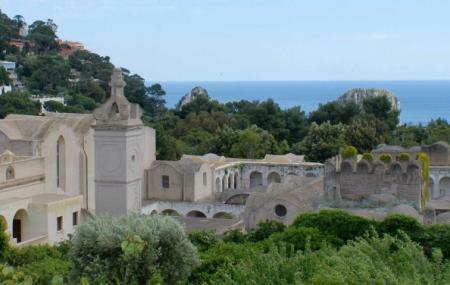 Find hotel near The Charterhouse Of San G ..
La Charterhouse of San Giacomo is one of the oldest structures on Capri, built in 1371 by Count Giacomo Arcucci of Capri, who later became a monk himself. It was originally a convent. After having suffered extensive damage during the 16th century and being used as barracks, hospital and a military prison, the Charterhouse was restored to its original glory in 1927. Today, part of the building is used as Capri's Classics high school. In the Prior's apartments, there are often temporary photography and contemporary art exhibitions, while the outdoor spaces host important events, including concerts and live shows. The frescoes and paintings inside the monument are noteworthy. There are spectacular views overlooking the garden. There are often special exhibitions, either free or requiring a separate ticket purchase. The funicular station is located to this attraction. A hidden beautiful monastery and gardens at last no so many tourists. Interesting place, specially if you like Escher and/or the Monument Valley games. It will remind you of them!